ONANCOCK –Civil War history is on the move in Virginia as its custom 18-wheel Civil War HistoryMobile rolls into the Eastern Shore for a three-day visit Sept. 6-11. An initiative of the Virginia Sesquicentennial of the Civil War Commission, this walk-through museum on wheels will be at the Barrier Islands Center in Machipongo Sept. 6-8 and at Ker Place Historic House Museum in Onancock Sept. 9-11. The HistoryMobile’s appearance is part of the “Observations and Disco-veries of the Civil War” events sponsored by the Eastern Shore of Virginia Historical Society. The HistoryMobile contains a high-tech imm-ersive experience detailing Virginia’s incomparable place in Civil War history. The exhibits were designed through a partnership between the Fredericks-burg/Spotsylvania National Battlefields Park and the Virginia Historical Society and examine Virginia’s Civil War history from the viewpoints of soldiers, civilians and slaves. The HistoryMobile is also supported by the Virginia Tourism Corporation through which visitors can obtain information on visiting Virginia Civil War sites at the exhibit, as well as by the Virginia Department of Motor Vehicles. Visitors will encounter history in ways they may have never experienced as they are confronted in the Battlefield exhibit by the bewildering sense of chaos experienced by soldiers. The Homefront exhibit calls on visitors to place themselves in the shoes of wartime civilians and make the choices that faced Virginians of those times. The Slavery exhibit looks through the eyes of those who escaped to freedom and those who waited for freedom to come to them. The enduring legacy of the war is presented as a loss/gain scenario that challenges visitors to examine their own perspectives. More information on the HistoryMobile and the Virginia Sesquicentennial of the Civil War Commission can be found at http://www.virginiacivil war.org. For information on visiting Civil War sites throughout Virginia go to www.Virginia.org/CivilWar. Off-road driver arrested on numerous charges at Stafford County’s under-construction Civil War park. An off-road joy ride yesterday morning led to a Stafford County man’s trip to jail in the back of a Sheriff’s Office squad car. Deputies went to the county’s under-construction Civil War park off Brooke Road near the Rappahannock Regional Landfill after receiving a call from a nearby resident. There, county authorities found a mud-covered Jeep overturned next to a large dirt mound. A man deputies found there at first told authorities he was not the driver of the Jeep and insisted that the driver had fled the scene, said Sheriff’s Office spokesman Bill Kennedy. But Kennedy said the man, who was not injured, later acknowledged that he had been the driver. Police charged Ryan Eilenfield, 24, of Stafford with trespassing, driving under the influence and obstruction of justice. Friends of Stafford County Civil War Sites Director Glenn Trimmer is overseeing the construction of the park. He is happy with the progress so far, but said that the activity–and the large dirt piles–have attracted off-road vehicles and all-terrain vehicles. He said that it is important for people to obey the posted signs at the park and refrain from trespassing on the construction site. Trimmer also said that relic hunters are not allowed on the property. He said the situation will improve once the park is opened and visitors come to see what is a very rare and well-preserved example of Union fortifications. “The people who care about the history of the site” will act as the best deterrent to unwanted behavior, Trimmer said. Phase one of the construction project was recently completed, with the National Guard having rough-graded three roads and installed a creek crossing last month. The National Guard is scheduled to complete its portion of the project in June 2012, with the park opening the following fall. When it is complete, the park will be opened to the public. Until then, it is off limits. GRAND RAPIDS — In the shadow of the old South High School on Hall Street SE, current home of the Gerald R. Ford Job Corps Center, sits a boulder steeped in history. 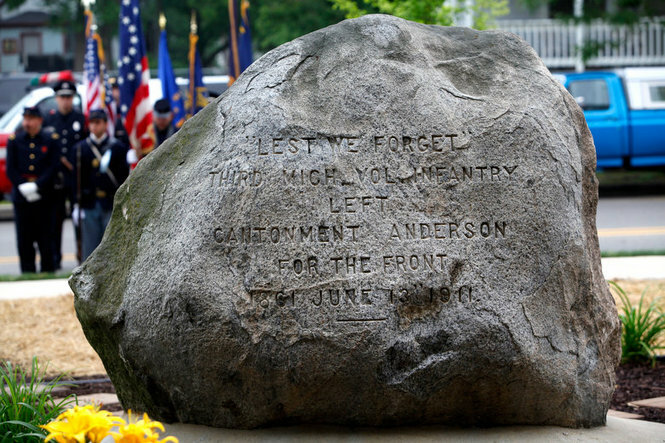 The large rock, inscribed with the words “Cantonment Anderson,” is a tribute to the Third Michigan volunteer infantry regiment soldiers who fought in the American Civil War, and it rests on the site of the regiment’s original muster in May 1861. The boulder, first dedicated in a reunion of surviving regiment members 100 years ago, was rededicated in a memorial ceremony on Saturday, two days shy of the regiment’s 150-year departure anniversary. A new informational tablet also was unveiled that details the history of the spot and the men who left there to fight and die in the war. By horseback, stagecoach and train, scores of men from the surrounding counties arrived in Grand Rapids following the call by President Abraham Lincoln for troops to preserve the union following the April 12, 1861 attack on Fort Sumter by Confederate rebels. They organized into companies on 40 acres at the Kent County Agricultural Fairgrounds along Kalamazoo Plank Road, or what’s now South Division Avenue. It was not a beautiful spot, said Britten, but rather a swampy area in need of proper barracks. The name “Cantonment Anderson” is an apparent homage to Major Robert Anderson, former commander of South Carolina’s Fort Sumter, said Bruce Butgereit, executive director of History Remembered Inc.
Excerpts from soldier’s letters describe a race track that was used for camp drill and a semi-circular, two-story hall that lodged 700 men in shared ship-style bunks with a straw beds and blankets. The smell was apparently quite awful. Meals were mostly beef, bread, butter and potatoes, with an “indescribable” soup for dinner and coffee in the morning. Camp was a rowdy place full of men who “soon found out what it was like to be in the south wearing wool in July,” said Britten. The 1,040-man regiment left for the front via the rail depot at Leonard and Plainfield, marching through downtown to the waved handkerchiefs and tearful good byes of the city’s residents, said Butgereit. The Third Michigan saw action in a dozen campaigns before being disbanded mid-war, when the remaining men were rolled into the Fifth Michigan regiment, Britten said. Men from the “Old Third” fought and died in storied battles like First and Second Bull Run, Fredericksburg, Chancellorsville, The Wilderness, Spotsylvania, Cold Harbor, Petersburg, Appomattox and Gettysburg. The regiment was originally commanded by Colonel Daniel McConnell, who resigned after six months. Stephen Champlin took over as colonel. He died in 1864 and is buried in Fulton Street Cemetery. Saturday’s ceremony was presented by the Michigan Commandery of the Military Order of the Loyal Legion of the United States, and the Gen. John A. Logan Camp No. 1, Sons of Union Veterans of the Civil War. The Schubert Male Chorus sang the national anthem and “America,” as color guard volunteers in period dress performed rededication rituals preceding the tablet unveiling. It’s easy to forget that 150 years ago, battles were fought hand-to-hand, said Heartwell. More than half of the Third Michigan suffered some kind of casualty, said Britten, whether it be a battle injury, disease or the result of primitive field medical treatments that often did more harm than good. More than 286 Third Michigan men died in service. Some were captured by the Confederacy. Two men received Congressional Medals of Honor; Benjamin K. Morse, buried in Lowell, and Walter L. Mundell, buried in St. Johns. “This boulder and tablet ensures that they haven’t been forgotten,” said Butgereit. The original boulder was placed on site by the Sophie deMarsac Campau chapter of the Daughters of the American Revolution on June 13, 1911. Press stories about the dedication in 1911 said about 130 members of the regiment survived at the time and 65 of them attended a banquet to mark the 50th anniversary of their deployment at the Morton House in downtown Grand Rapids. Britten said the 126th Army National Guard Cavalry Regiment stationed at the Grand Valley Armory in Wyoming traces its roots to the Third Michigan. WASHINGTON – Have you toured one of the many civil war battlefield’s in the capitol region and wished that you had an historian at your side? There’s now a 21st century way to do that. If you tour the battlefield at Fredericksburg, Gettysburg or soon, Bull Run, you can download your own historian in the form of an “Battle App” for $1.99. “It takes you to familiar sites, as well as obscure sites,” says Jim Campi from the Civil War Preservation trust. The app for Fredericksburg, where Union and Confederate troops fought a fierce battle in December of 1862, takes you through the downtown area where there was considerable fighting, but most people never check out when they view the current battlefield. “What we are really trying to do is put an historian in your pocket, give you the flavor of going out there with a guided tour,” says Campi. The applications are all part of an effort to spark more interest in Civil War sites as the 150th anniversary of the conflict moves ahead. Apps for Fredericksburg and Gettysburg areavailable now. One for Bull Run is coming in July, as the actual anniversary Battle of First Manassas arrives. There are plans to add Chancellorsville, Ceder Creek, the Wilderness, Petersburg and Malvern Hill in Virginia and Antietam in Maryland. The money collected from the apps will be used to create more apps and to upgrade them from time to time. Visitors to Civil War battlefields in the Fredericksburg area will have a new guide to help them see the historic sites. A “Battle App” will be introduced Wednesday by the Civil War Trust, state officials and the Fredericksburg Department of Economic Development. According to the trust, the application uses GPS technology and Apple’s iPhone platform to help visitors locate and learn about historic sites. The smartphone content includes audio, video and animation. 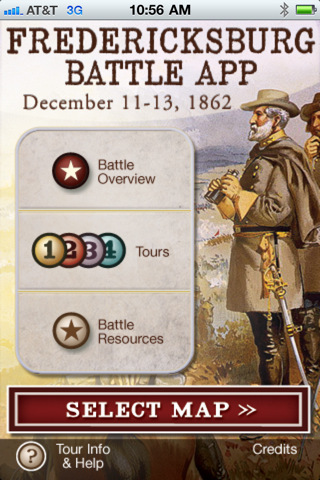 The Battle App offers four individual tours of sites protected by the National Park Service. It also includes lesser-known battlefield locations in downtown Fredericksburg and the area. The Battle App will be introduced and demonstrated at a news conference in the historic city.